This festival decorates flame lamp is with lifelike modelling, can drive festival atmosphere very well, it can be used as bedside lamp in ordinary times, also be a good household decoration. High light penetration PC shell, uniform light transmission. Fine quality light bead chip, 360° dynamic flame glowing effect. 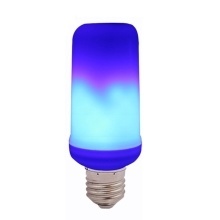 High heat dissipation lamp body, good heat dissipation effect, long service time. E27 lamp holder, excellent electrical conductivity, strong and practical.